A small Woodburytype portrait of the cross-Channel swimmer Captain Matthew Webb (1848-1883). 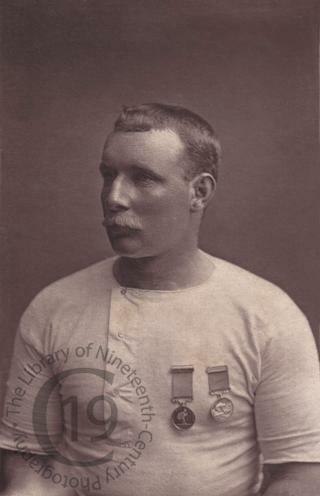 Born in the Industrial area of Dawley in Shropshire, Webb became the first man to swim the English Channel, at a time when the feat was considered impossible. His first attempt having ended in failure due to the strong current, he eventually made the crossing from Dover to Cap Gris Nez on the 24th and 25th of August 1875 in 21 hours and 45 minutes. Relying mostly on the breaststroke, he swam some 40 miles, covering a straight-line distance of about 22 miles. Covered with a protective layer of porpoise grease, he was accompanied by a support boat. Along the way, he sang, sipped beef tea and beer, was stung by a jellyfish, and had to fight his way through a storm. Captain Webb died eight years later, on 24 July 1883, in an attempt to swim the Whirlpool Rapids at Niagara Falls.